As we sat at the table and started up the discussion, much of the briefing included quite mundane information as well as some deeper information. This included what was going on with the various loosely affiliated factions of the Earth Alliance. I was made aware of recent Cabal false-flag attempts that thankfully did not succeed – though others obviously have. We also discussed mass intelligence gathering that has been both acquired by Earth Alliance groups as well as SSP Alliance Council efforts. This was accomplished by hitting secure western databases – and the results were very visible in the news headlines. I also found out that some rogue members of BRICS have been infiltrated by the Secret Earth Government syndicates, known to most as the Cabal. Gonzales and I also discussed his recent stand-in delegate role at the “Human Like” ET Super Federation conference. The Super Federation is a larger group made up of a United Nations-type organization of other “Human-Like” ET Federations, Confederations and Councils. These are not the Draco Federation Alliance groups, and the other beings associated with them that have been referred to the Orion Group by many. This Orion Group is made up of quite a bit more than just the Draco Alliance. I did learn that there is a small council made up of some of the Ancient Human Breakaway groups that I was previously unaware of. It turns out that Gonzales has been meeting exclusively with this group as a delegate for the SSP Alliance Council. Gonzales stated that I may be either accompanying or handling some of these meetings myself in the future. I do find it important to remind people that many of these are Earth human terms to describe these groups, and not what they refer to themselves as. I will give what details I can of the two briefings we had, in order. At our second meeting, Gonzales was more interested in mending fences and doing some IE readings to feel me out after the recent meeting I had with the SSP Alliance Council. This was the meeting that went very badly, and resulted in a major falling out between myself and some of the individuals present. We have discussed that thoroughly on more than one occasion since it first happened. Once that topic was covered, I asked some questions about the previous briefing that he had given me. I was looking for more details since he was in a laid back and talkative mood. Gonzales did not disappoint in this regard, because he went straight into talking about the Draco White Royal and Chairmen of the Committee of 200 meeting that I reported on in Part 1. After we were finished taking about this subject, we sort of backed away from topics to relax a little more. It was very unpleasant for Gonzales to recount the meeting with the White Royal, and it was difficult for me to listen to and relive my own experience. Gonzales asked me if I minded if he ordered a beer. I’d never seen him do that, as he was usually all business -- either drinking coffee or iced water when we have met. I did not object, and indeed thought it may relax him more for the rest of the discussion. We had some small talk while we both finished a beer. Then he asked me if I have been watching the latest propaganda on television. I knew he was referring to the MSM news. I told him I try my best not to watch it. This is when he mentioned what was going on with a few EU countries financially, and the recent round of high-level government hacks that have occurred – not just to US databases, but to the entire Western World. Gonzales stated that these hacks were incredibly pervasive -- and that they had also hacked the Secret Earth Government and syndicates’ “Dark-Net”. Gonzales said that very little of what was taken has been reported in the MSM. Nonetheless, a stunning amount of intelligence was obtained and compiled into the database we had so far that has been contributed to by several parties. The information that was accessed, however, is well known by the upper caste of what most people know as the Cabal groups. They are heavily panicking about these breaches of sensitive data. There have also been recent defections of Cabal members who have brought evidence and the promise to testify to the SSP and elements of the Earth Alliances. These defections and the recent hacks are behind the pickup in activity of “Elites” moving their families to their safe zones. There were also some recent hacks to obtain further information from one of the major letters from the BRICS Alliance. Unfortunately, this particular country has been heavily infiltrated by the Cabal. The Cabal has infiltrated just about everything you can think of. The ufology field has been completely infiltrated consistently since the 1950’s. Internet forums, blogs and some alt media have the same problems. There were some incidents that ended in some major attacks and loss of life inside the SSP Alliance Council because of certain infiltrators. This also caused some splintering and mistrust among some of the SSP Alliance Council for a time. This same infiltration has occurred within elements of the Earth Alliance. There is a push right now by the other members of the BRICS Alliance to isolate these infiltrated areas within one of their allies. Their goal is to prevent a typical Cabal divide-and-conquer operation, where the Cabal could use this new infrastructure to form a NWO 2.0. Russia and some of their allies, some of whom would surprise you, are well into a plan to try to prevent these problems from growing. If what he said is accurate, it sounds like Germany, Spain, France and of course Greece want out of the EU and the Western financial system. This would cause a domino effect felt around the world. I am not sure that these countries are ready to jump over to BRICS myself. Things are bad in the West, but BRICS still has some issues to work out. There was some moderate discussion of false flag attacks that were prevented. There was also discussion of the Cabal building out a more robust infrastructure for its AI System. This AI system is controlled by the ET/ED AI Signal that we have discussed in detail in other interviews and articles. We discussed the timing and plan of taking out this AI system, and how it would work. It seems the AI’s “probable future technology” has seen some of this. It is attempting to prepare for such a coordinated operation that would have to be undertaken to entirely remove the AI from the Sol System. The Cabal has been using this ET/ED AI probable future system for decades. They believe it to be foolproof -- and nearly 100% accurate. They have used it many times to stave off certain defeat, and it has proven to be highly accurate in its calculations. Interestingly, the AI did not predict the arrival or actions of the Sphere Alliance – nor the break away and defections of those joining the SSP Alliance. Therefore it is not a perfect system. Because of the new energies in the Sol System and the awakening of an increasing number of humanity to our co-creative abilities in this reality using our mass consciousness, we are making this AI and its “Prophets” very nervous. This AI component and the fragmentation of the Cabal Groups after the last couple of meetings is believed to be behind the threatening and theatrical meeting with the Draco White Royal, and the warnings given by the Committee of 200 Chairmen. The Chairmen also mentioned their ability to see into the future with their AI technology at that same meeting. In the prior conferences I had been the representing delegate, and he stood behind me to my left in an advisory position. The three IE support personnel sat in front and to the side of me in lower seats within our horseshoe-shaped designated position on the council floor. Before I was drafted into the SSP and was still training in the MILAB programs, I had served in the IE Support role. I remembered sitting there being bored, and not knowing what was going on or being said in the common language that was spoken on the floor of the council auditorium. We were given the smart-glass pads that gave us access to the ET database that the IEs used to keep our minds occupied while we were keeping a feeling out for any types of deception or danger. When I first appeared at this Super Federation council as a delegate and sat in the delegate chair, I was amazed to suddenly be able to understand the strange monotone common ET language that was being spoken. Everything that was said sounded like English in my mind. It was also the first time that I wasn’t completely ignored by the other ET delegates, and was interfaced with in order to communicate. The SSP Alliance Council was extremely unhappy that none of those present except myself understood what was going on -- and that they had to rely on me to give them an accurate briefing of what was communicated. From the very beginning, they had wanted Lt. Col. Gonzales to be the main delegate -- and had not made it a secret. They had also made it clear that I didn’t work for them, and no material support would be provided. Not being able to understand what was going on in these meetings for their own people to gather intelligence was yet another point of contention. My relationship with several of the SSP Council Members has gone further downhill after a recent meeting regarding incidents that occurred with my family, which I will cover to some degree in my next report. Gonzales stated that he had met with Raw-Tear-Eir before this conference, and again after the report to the SSP Alliance Council that occurred after the conference. Tear-Eir had communicated to him what he was going to be conveying at the conference, as well as some information to do with the Draco White Royals and some other ET groups that have been trapped inside the outer barrier since the beginning of the year. Gonzales stated that he was feeling pretty excited about attending this council meeting and sitting in the chair for the first time. He went on to tell me about the arrival at the Federation Council Meeting Facility. This is a station that is in a secure temporal bubble out around the orbits of Jupiter and Saturn. When you enter into the temporal bubble, you can see the station and docking ports for all of the other delegates floating freely in the middle of a completely pitch-black bubble. You cannot see the sun, planets or stars from inside this space/time anomaly. Gonzales and the crew docked, went through a security scan for AI and other outside technologies, and were allowed in. Gonzales said he was immediately treated like he mattered this time, as opposed to last time when the other delegates and support staff only interfaced with me -- and ignored the IEs and him. He said it was all very polite, with respectful communications and treatment from everyone the entire walk down the passage from the space docks to the meeting hall. Gonzales and the IEs could feel a different energy in the air that was more one of anticipation, instead of the mixture of anxiety and agitation from the previous times. Gonzales said that he walked briskly to get to the Sphere Alliances Delegation seating area. On this trip he had one of the high-ranking SSP Alliance Council members with him, who stood in the advisory role position. This is one of the people who I have since gotten in a major argument with. Gonzales had left the detail of them being present out of the first briefing. The IE Support team took their seats. They were handed smart-glass pads by an attendant, and Gonzales sat in the Delegate chair. Gonzales said he half-expected some sort of tingling sensation or feeling to let him know he had interfaced neurologically with the chair, but he felt nothing. Soon after the rest of the delegates had arrived and were seated, one of the delegates made their way to the platform area, which was behind a long narrow table that jetted a long way out toward the room. Every so often, holograms have projected above the middle of this table, but this was not a normal occurrence. As usual, there was another type of being with a smaller stature who acted as attendants. They also do a sort of strange sign language that reminds me of the Native American sign I witnessed when I was younger. The first delegate that stood up was one we were familiar with. He was a very tall pumpkin-orange-skinned being with blue eyes, no hair, and a cranial ridge running back towards the crown of the head from ear to ear. He was wearing an off-white robe, much like you would see a monk wearing. He said he was then introduced by this being, and it was time for him to walk to the front and take its position on the small stage. When I had been in this same situation and was walking to this small stage, I remembered wondering how I was going to communicate. Then, when I was situated I just started speaking English for my short presentation. After that, I went back to sit at the chair that was automatically translating the strange ET language for the first time. It wasn’t until after the meeting that I was asked by my team what I was saying while I was up front. I was a little confused and told them “You were there!” They told me “Corey, you were speaking that strange language”. I was certain that I was speaking English. Gonzales said that he could see the Earth Delegation from where he was standing, and they had serious looks on their faces with their arms crossed. He assumed they were once again Committee of 200 members, or a similar allied group, by the way they were dressed and carrying themselves. It is very unusual for one group to be on the Earth Delegation rotation more than once at this particular meeting. If this was indeed them, this would now be their fourth or fifth rotation. There had been dozens of petitions by ETs who wanted to retrieve their teams who were on expedition missions to Earth to study the planet’s oceans, jungles and other aspects of nature. These ETs were completely uninterested in interacting or meddling in the affairs of humanity, or with interacting with other ET Groups who were present in our Sol System. They were positive groups who were only interested in the planet’s biosphere. Since being trapped on Earth, many of these smaller expeditionary teams had been running out of needed supplies and had begun to be hunted down by human and negative ET Groups. Gonzales stood before the Super Federation Council, which normally had 40 to 60 groups in attendance. Now it had well over 100 groups all massed together in the auditorium. He announced that the Earth’s barrier was going to be relaxed, and that these groups would be allowed to return back to their support teams who were here in the Sol System, trapped inside the outer barrier. The Earth’s traffic would go back to a strict grid authorization system – an air traffic control-type system -- and would be enforced by the more advanced SSP Alliance vessels. Gonzales stated that you could feel the relief in the room as he finished his short message and presentation. He returned to his seat. Once again, as in the previous meetings, group after group took turns taking the stage to make short statements of what they had contributed to the Earth, humanity and the Grand Experiment. He said it took some time for each of them to toot their own horns and put a positive spin on their activities in our Sol System before the meeting was adjourned. Gonzales stated that several groups showed appreciation on his way out of the auditorium and down the passageway back to the space docks, where their vessel was located. They then returned to one of the SSP Alliance Council’s bases of operation for debriefing. 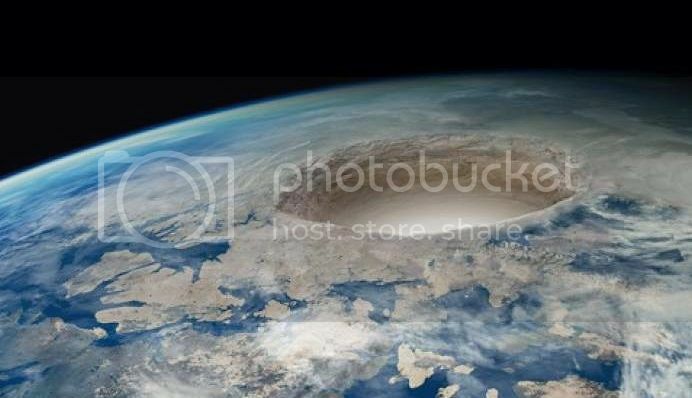 The SSP Alliance informed him upon arrival that there had already been quite a few vessels leaving the Earth’s atmosphere, and heading to larger cloaked vessels close by. Most of the visitors to the Sol System that want out are positioned in the outer Sol System, hoping for the barrier to drop and working to figure out a way to get past it. The SSP Alliance Council was very happy with Gonzales’ performance. This only reinforced their position that he should be the main delegate. This, of course, was thrown in my face yet again in the argument that broke out in a later meeting with the SSP Alliance Council. This later meeting concerned the intrusion of my home and the abduction of family members by a very tall six-fingered Nordic group that was very hostile. I will go into as much detail as I can in the next article about those incidents, the follow-up SSP Alliance Council meeting, and my meeting with the Blue Avians right after. I want to emphasize that we are safe and I have been assured that no further incidents like this will be allowed to take place, providing that certain protocols are followed. I do expect to see quite a lot of interesting UFO reports for a while with the sudden coming and going of vessels from our atmosphere. There are also going to be some small battles going on between some vessels and groups down here, on and below Earth. The Spheres have been giving us more time to adjust to the increasing energetic waves that have been flowing into our Sol System and causing electrical changes in all of the planets and the Sun. These spheres are slowly reducing how much of this energy they are buffering. At some point in the future, the spheres will disappear completely. Some people will be acclimated to these energies and others will not. Many people are not comfortable with how much of the outcome of our future reality is up to each of us personally and as a group consciousness. Others would prefer that some of these advanced entities come and make the changes for us -- or save humanity. We are being given the opportunity to awaken and fix our own problems with the powerful tools that we have deliberately been kept ignorant of. The power of our mass consciousness, and the positive trigger of the loving and forgiving spectrum of emotions, are ours to claim -- and they will forge a new reality. There is more going on in space than you can ever imagine. Out of sight, out of mind. That is how the greatest secrets in the history of humankind have remained hidden from the populace. For the first time ever, a 30-year insider has come forward to reveal over 70 years of humanity’s hidden history in space. Corey Goode joins David Wilcock in this inaugural presentation of Cosmic Disclosure to offer an overview of their upcoming interviews which detail the history and extent of humanity’s celestial presence. I watchted that first episode. I thought it was strange, I mean the interaction between them. I mostly listen to videos, rather than watch them - so I went back to watch. Corey seemed nervous and was sweating. David seemed to snap at him, rather than speaking as gently as Corey - as if he was trying to push him forward. I did get then sense that they had gone over this ground before, and were trying to revisit previous conversations. "We are going to go through a transformation experience which is going to change us on a consciousness level"
DW: "What would that look like? Would we become more psychic, more telepathic?" CG: "Yeah, I mean, there's a lot of theories... I haven't been told we are going to be able to do this or that." evolved who are going to start showing these signs earlier. I don't have all the answers." DW: "How do we know we can trust them." 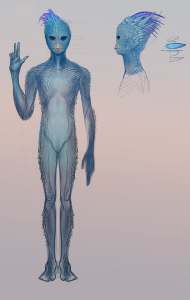 CG: "They are definitely of a higher vibration... From what I know of high density beings..."
(Paraphrasing: They do not have specific selfish agendas, as we 3D humans have. "We need to become more loving, and forgiving - to stop the wheel of karma. We need to become more Service to Others, on a daily basis." ... "You don't need to change your church or religion... Time is short." DW: "They are not trying to pose as the new god." CG: "Absolutely not... They have pushed in my mind that this is not to become a cult, or religion." Which method of disclosure is used, will depend on what will buy the elites the most time. JC: Will they parade ET on stage? 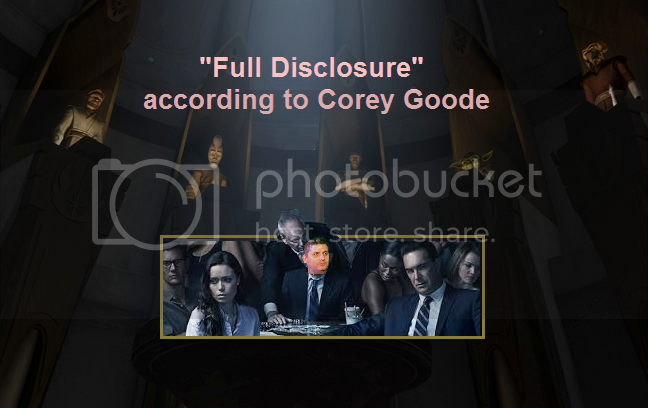 CG: There are several different scenarios, and their main objective would be to prevent a FULL disclosure event... that's more that just saying: "there are aliens." In the beginning, we were "at their mercy", but different groups took guardianship at different times. After Roswell, a deal was made to allow abductions, in return for technology. And later the SSP saw that they could barter humans for things they wanted, and they began the galactic slave trade. ET's want human for their engineering skills, and for their flexible and useful DNA. DW: "When ET zap our DNA with certain new energies from our sun, it gives them superpowers." CG: Our genes have been re-engineered so many times, that they reach out to be spliced, with other DNA. and our emotions have a wider range than that of most ET species. The emotions can be used to modify and control our co-creator capabilities... Now, they still want to keep the experiment going, they have a long term plan that is not finished yet. The grand experiment is about the evolution of consciousness. Other species want to use the experiment to enhance their own evolution. Even as fiction it's boring. For some good action tune into Strike Back. Bill Ryan This is from the book. In this model (despite Stephanie's labeling in her diagram), there aren't two different timelines. There's only one — with the subject moving back in time only at the end of their tour of duty. The SSP in present time on Planet Earth sends a recruit to the SSP on Mars, at the same time. This is only travel in space, not time. 20 years later, the SSP on Mars (the same one, but 20 years from now) sends the recruit back to WHERE AND WHEN he came from. It's like he was 'borrowed'. That's the only time travel part of the entire zig-zag... the bit when he returns. If there are any administrative records, we can presume that the present and future SSPs would somehow have the means to communicate with each other. If they can send people back, they can surely send paperwork (or information!) back as well. Extraordinary changes are already underway for planet and people, and an alliance of advanced civilizations have come to serve as guides for our collective transformation. To help facilitate the coming changes these beings have named a spokesperson to reveal who they are and why they have come. Corey Goode recounts when he was established as the delegate for the Sphere Being Alliance, and his first encounter with the Blue Avians who explained the nature of consciousness, life after death, and the shifting conditions for life on Earth. This was pretty interesting - "David's going all Jesus freak"
All of this data has come together at the same time in a very intriguing fashion. Corey's journey altered the content and nature of this report. I highly recommend Corey's new post. He spent two weeks working on this writeup, day in and day out -- and it shows. dating back to at least the Roman Empire. Many have called these “Secret Earth Government Syndicates” the Illuminati or Cabal. I'm thinking "why?". How do these fairy tales connect with everything else going on in the world? + Money seems to have disappeared from our economy - through drug deals, through fraudulent bonds, through excessively and unaccountable military spending. Where has it gone? + UFOs are often seen near military bases and it is rumored, they are ours. Is the SSP what we are seeing? + Abductions have been recorded by thoousands, tens of thousands, and maybe hundreds of thousands of people. There is often said to be someone in the UFO dressed in military garb. Does this explain why he is there. Is he representing the SSP? Coast to Coast AM Interview with Michael Salla and Corey Goode (9-14-15)..
From the sublime (DS) to the ridiculous (SSP) ? I think the existence of Deep State should be obvious to everyone by now. We should be able to see that someone is pulling the strings of our elected leaders. in order to keep the SSP funded - later the DS and SSP was funded in other ways: like drugs, financial manipulations. But what is the state of the SSP now?? The interview that David Wilcock will blow your mind, if you haven't heard it. Wilcock herein interviews someone who says he was (and still is?) part of the SSP. They talk about the advanced science and medicine used by the Secret Space Program. Is this genuine? It is very hard to say, since there is so little direct evidence to confirm or reject it.